Metals Depot carries a large selection of flat bar made from alloy, steel, aluminum, brass, tool steel, and more. It is broadly used for industrial tools, mechanical parts, structure construction, base plates, ornamental fence construction, and more. 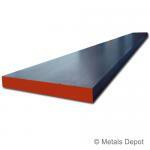 Metals Depot has flat bar available in a range of standard sizes as well as customized cut-to-fit service. Shop for Alloy Steel Flat Bar - 4140 Online! Shop for 6061 Aluminum Flat Bar Online! 360 Brass Flat Bar, often used for its decorative purposes when polished to a high luster, is used in applications when electrical conductivity, strength, and corrosion resistance are required. It is easy to braze, cut, and machine. Typical uses include fittings, marine hardware, fasteners, etc. 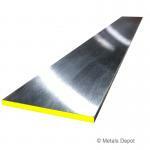 Shop for 360 Brass Flat Rectangle Online! 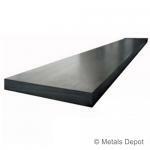 C1018 Cold Finish Flat is made from rolled steel. With its close dimensional accuracy and smooth surface finish, it is easy to weld, cut, form, and machine. It is commonly used in fixtures, mounting plates, and machine components. Shop for 1018 Cold Finished Flat Online! Shop for 110 Copper Flat Bar Online! Shop for Galvanized Steel Flat Online! 304 Stainless Steel Flat has two qualities which make it suitable for many applications: greater strength and premium corrosion resistance. The durable, dull, grainy finish quality makes this product suitable in fabrication projects where exposure to the elements is an issue. This material is mill finished, not polished. It is easy to weld. Shop for T304 Stainless Steel Flat Online! 4140 Alloy steel flat with its chromium and molybdenum content provides great hardness, strength, and wear resistance. It is often used in machine parts. 4140 Alloy Steel Flat is moderate to weld, cut, and machine. Shop for T316 Stainless Steel Flat Online! Hot-rolled Steel Flat is used widely in general fabrication and repairs in general maintenance, agricultural implements and transportation equipment. It is easy to weld, cut, form, and machine and is frequently used in framework, braces, supports, plates and straps. Shop for Steel Flat Bar Online! A2 Flat Ground, a chromium alloy die steel, is known for its good machinability, deep hardening, high compressive strength and good non-deforming property. It is sold in annealed state to be heat treated. It is used to make shear blades, punch plates, dies, and more. Shop for A2 Flat Ground - Tool Steel Online! D2 Flat Ground is known for its air-hardening, high carbon, and ability to resist wear. Its chromium content makes it mildly corrosion resistant. It is frequently used for shear blades, dies, and punch plates. Sold in its annealed state to be heat-treated, it will resist size change upon deep hardening. Shop for D2 Flat Ground - Tool Steel Online! Due to its tungsten and chromium content, 01 Flat Ground has enhanced wear resistance. It is used frequently in the manufacturing of tools and dies, molds, knives, taps, and punch plates. It has high machinability and decarburization resistance. 01 Flat Ground is sold in its annealed state to be heat-treated. 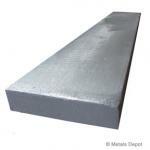 Shop for O1 Flat Ground - Tool Steel Online!